Apple is putting the 'world' in its Worldwide Developer Conference on Monday by announcing that Apple Pay is coming to the UK, reveals a new report. 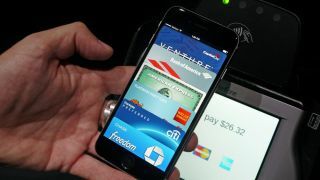 The iPhone 6 and iPhone 6 Plus NFC-based mobile payment platform is expected to launch in the UK in two months, according to the Telegraph. MasterCard executives reportedly said they are "absolutely ready" to support Apple Pay in the UK, as Lloyds Bank and Santander UK may be launch partners, claims 9to5Mac. Apple Pay is currently limited to the US, but also rumored to be making its debut in Canada this later this year and China in the distant future. The UK would essentially jump to next in line. Apple Pay's UK launch is an important milestone for the Cupertino company's digital wallet service, but it may be an early blip in WWDC 2015 keynote. The software-focused conference is expected to reveal the last iOS 8 update, iOS 8.4, and preview the iOS 9 beta for developers. Both are likely boast new features and behind-the-scenes stability tweaks. The Mac operating system is also due for a refresh, ratcheting up the build to OS X 10.11, and the Apple Watch may receive an update beyond the recent OS 1.0.1 incremental bump. A new Apple TV was supposed to debut at the WWDC, but deals with content owners are said to have delayed the set-top box and its rumored live streaming service. We're not surprised. Streaming content fans will have to settle for the likely debut of Apple Music.